(Nanowerk News) Graphene based devices have shown outstanding electrical and optical performances. However, the properties of graphene devices are extremely sensitive to environmental factors, such as humidity or gas composition, making a reproducible operation in normal atmosphere impossible so far. Researchers from AMO GmbH and Graphenea SE have now demonstrated a sophisticated encapsulation technique enabling highly reproducible operation of graphene devices in normal atmosphere for several months. Generally, adsorbates from the ambient (such as moisture or oxygen) and residuals from lithography processes used during device fabrication adhere to the graphene and change its doping level unintentionally. As these contaminants are unstable under normal conditions, the doping level and hence the electrical and optical properties of graphene devices also change. The variation in these parameters is a major roadblock for using graphene devices in applications. 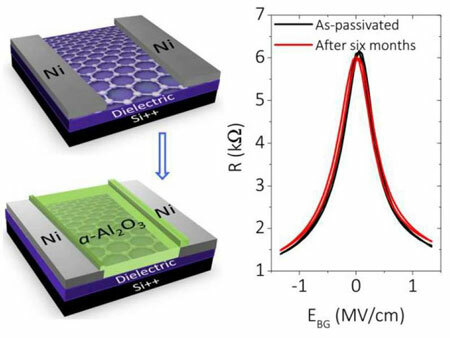 The researchers at AMO GmbH and Graphenea SE have identified this problem and investigated the encapsulation of graphene field effect devices using aluminum oxide, an encapsulation material well known for OLEDs. The key parameter for device passivation found in this study is the growth of an oxide layer using a properly in-situ oxidized aluminum seed layer. The employed passivation layer is able to persistently stabilize the device characteristics over several months when stored and measured in ambient atmosphere. This is a major step towards the use of graphene devices in real applications. The research work is published in the Royal Society of Chemistry journal Nanoscale ("Highly Air Stable Passivation of Graphene Based Field Effect Devices"). The work is financially supported by the European Commission under the projects GRAFOL (contract no. 285275), Flagship Graphene (contract no. 604391), and by the German Science Foundation under the project Ultragraphen (contract no. BA3788/2-1).